This home made cake recipe for Banana Chocolate Chunk Cake is just a variation of the traditional and well-loved banana bread, which first became popular in the US in the 1930s. 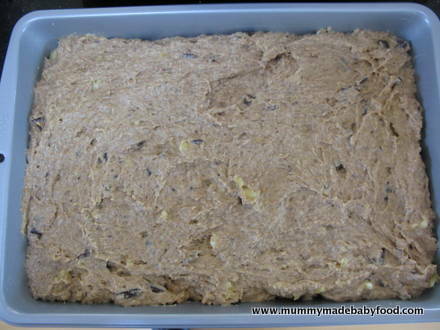 Banana bread is a great way to use up those overripe bananas that otherwise would have been thrown out - in fact, the riper the bananas, the more flavourful the bread. And if you can bake bananas into bread, then why not turn it into a cake and add in some chocolate to further sweeten the package! 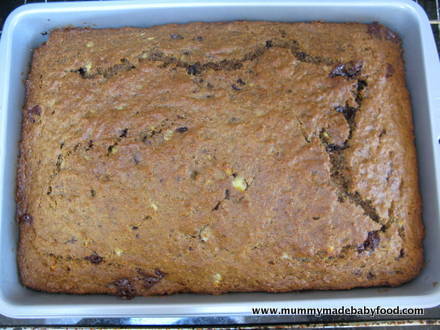 Bananas and chocolate are a popular pairing for desserts and puddings (think banana and chocolate crêpes or banana split with chocolate sauce), so it's only natural that the banana bread recipe would evolve into a cake that included chocolate. Certainly tasty enough to eat on their own, banana breads and cakes are also often served with frosting on top. Banana chocolate chunk cakes are often topped with chocolate or even peanut butter frosting. As this home made cake was for J's 3rd birthday, I opted for a classic vanilla buttercream frosting that would give me a pale background for decorating. You could even pair this cake with a plain buttercream or even cream cheese icing - whatever floats your boat. Had I not been making this for a kiddy's birthday, I might have opted to skip the frosting altogether, so it's entirely up to you whether or not you frost your cake, depending on the occasion! The best part about home made cake is that you can customise it however you want. 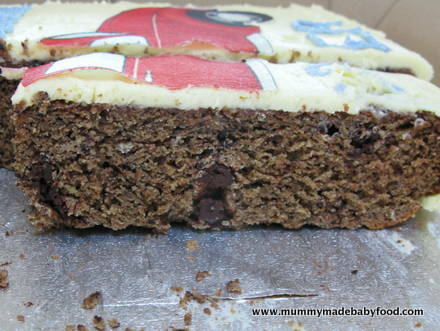 When making my cake, I used wholegrain flour, as that's what was in my cupboard - plain white flour will work just fine. I also used full fat plain yoghurt for extra moisture and creaminess, but this can be substituted for low fat, Greek or vanilla yoghurt. For the chocolate chunks, I chopped bars of good quality dark chocolate, as I generally find these tastier than commercially pre-packaged chocolate chunks or chips. You can also use milk chocolate chunks, and if time is short, feel free to used pre-packaged chocolate chunks. Note that the recipe requires the butter to be softened to room temperature, so don't forget to take it out of the fridge a few hours before you need to use it. This recipe yields enough batter for a 9"x12"x2" oblong cake pan. Place the oven rack in the lower third of the oven, and preheat it to 175C/155C Fan. Grease a 9"x12"x2" oblong cake pan with a bit of butter, and set aside. Mash the bananas in a bowl with a potato masher or the back of a fork. 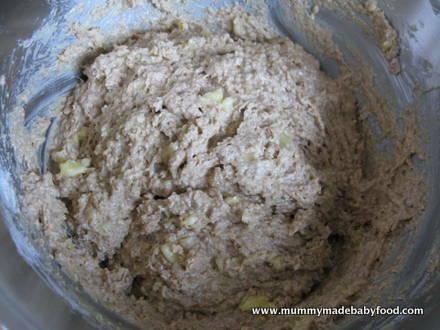 Using a hand-held electric or stand mixer, beat the butter and sugar together on low until incorporated. 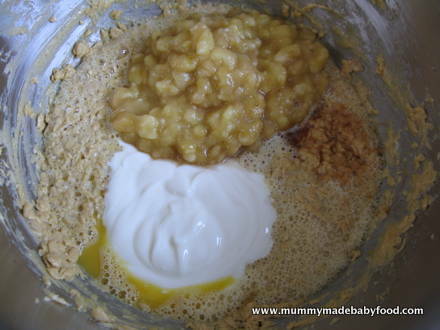 Then cream together by increasing the speed to medium, until fluffy and lighter in colour. 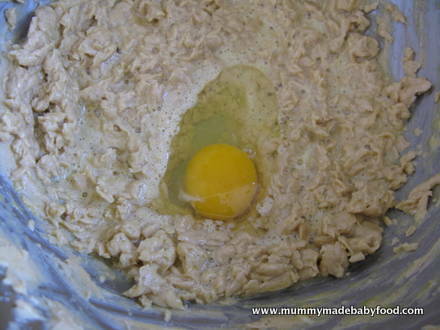 On medium speed, add the eggs one at a time, beating well after each addition. 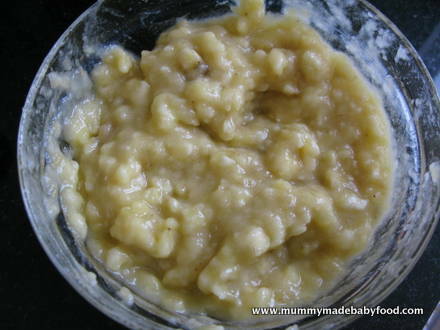 Then beat in the yoghurt, mashed bananas and vanilla extract on medium speed for about 1 minute. Set aside. 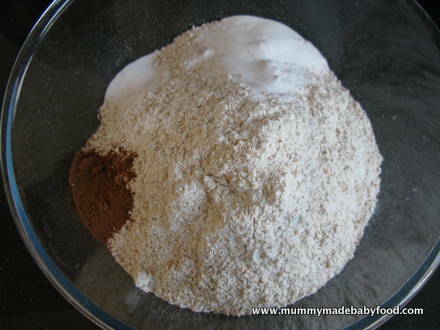 In a large mixing bowl, whisk together the flour, baking soda, salt and ground cinnamon until combined. Using a large wooden spoon, slowly stir the dry ingredients into the wet ingredients until well-mixed and no flour pockets remain. 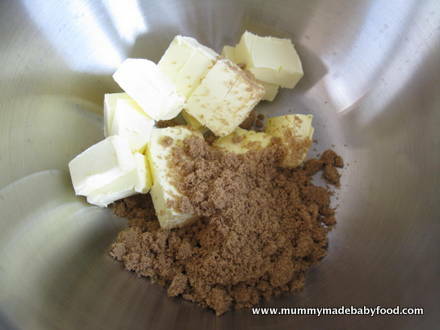 Do not over-mix, as this will toughen the cake. 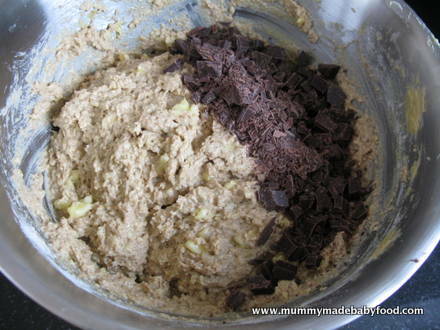 Fold the chocolate chunks into the cake batter. Spoon the cake batter into the prepared pan, and bake in the pre-heated oven for 60-65 minutes. Cover loosely with a sheet of aluminium foil about halfway through, to prevent the tops and sides from browning too much. The cake is ready when a toothpick inserted into the centre comes out clean. Remove the pan from the oven, and allow the cake to cool completely, in the pan, on a wire rack. Serve as is, or top with vanilla buttercream frosting and decorate. Sit back, and enjoy your home made cake!